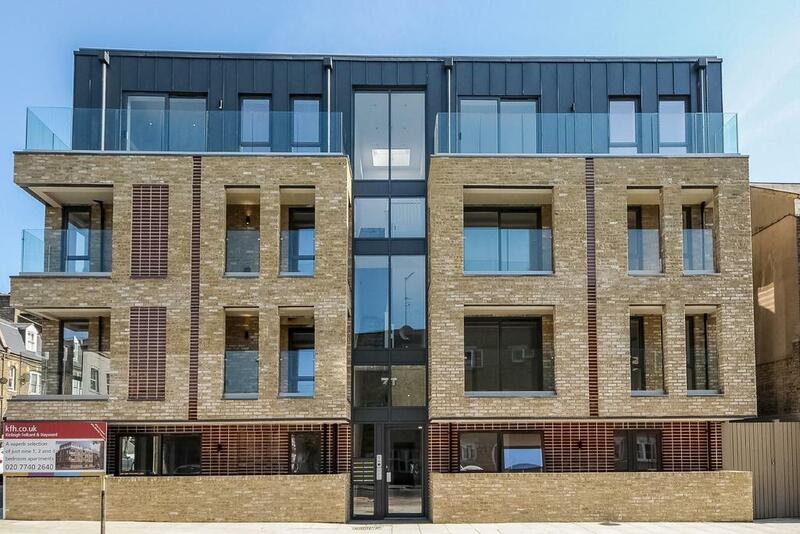 Just finished on the corner of Wanless Road and Herne Hill Road is a new Apartment Block. 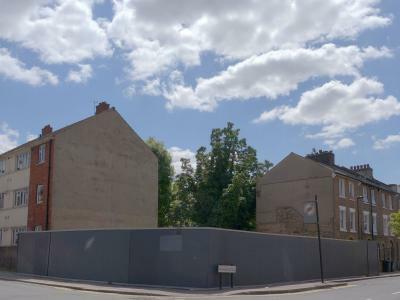 The site had been derelict and empty for many years following the demolition of a Public House that had existed on that corner for 125 years or so. That pub was known as the Herne Arms. The first landlord was Mr Alfred Chettle. He was landlord from 1878 to 1892 . 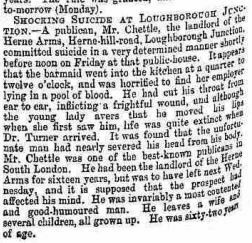 Unfortunately, Mr Chettle took his own life in 1892. Extract from Reynold’s Newspaper 27 November, 1892. The British Newspaper Archive. On 30th January, 1882 James Knight was tried at the Old Bailey for passing off counterfeit coin – namely a George 1V half-crown in a bakery at 150 Newington Butts. James Knight’s defence was he had received the coin as change in the Herne Arms, Loughborough Junction. However, presumably because there was not enough evidence and good character statements given he was found Not Guilty. Not a particularly clear photo – a scanned copy. It does show the Herne Arms in the upper right hand section. It was taken before 1913, as there are no Tram lines visible. 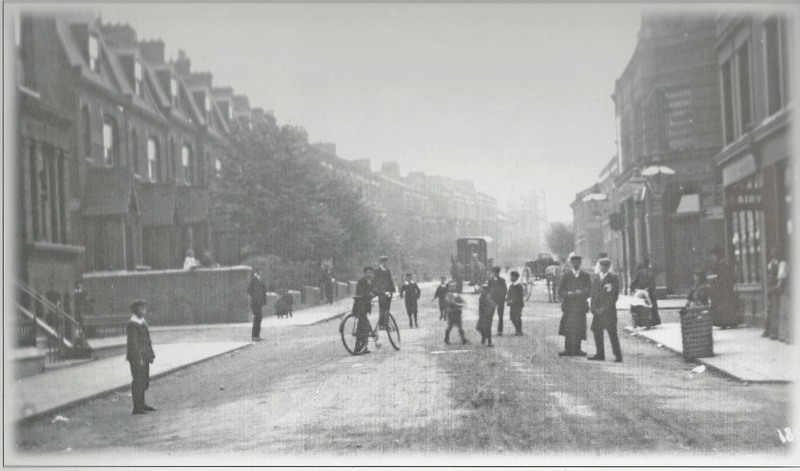 Photo taken in 2003 by George Young and found in the Herne Hill Heritage Trail published by the Herne Hill Society, revised edition, 2013. The pub did not have a particulary good reputation in it’s later years and was subject to regular police visits. 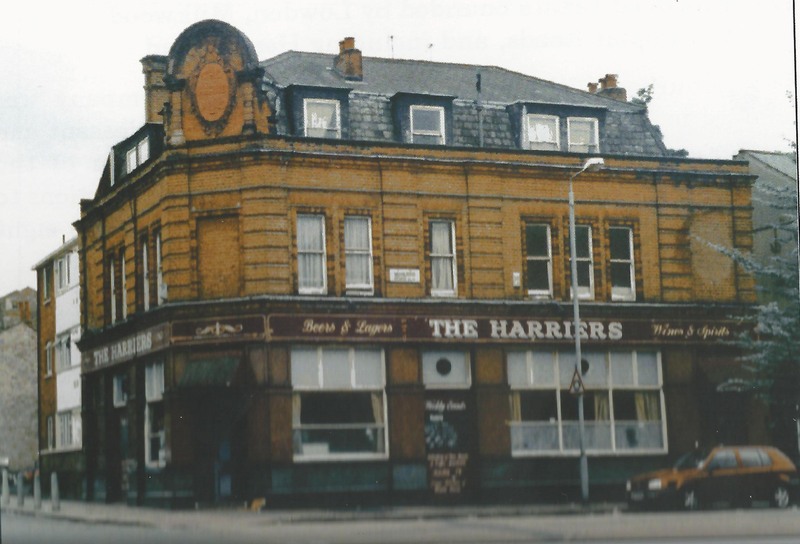 I did have a few pints on occasion in The Harriers but more often spent time in the Lord Stanley at the other end of Wanless Road. It was demolished by the developers in 2003,and remained vacant until planning permisson was granted for the current building in 2012. I do remember one incident returning home from work one day to find a crowd of people gathered around the plot. Apparently a stolen car had crashed off the road and landed in the dug out basement. This was, if my memory is correct before the solid fencing was erected. Herne Hill Heritage Trail published for the Herne Hill Society in 2003 by Local History Publications , revised edition re-published in 2013. This entry was posted in Pubs and tagged Herne Arms, Herne Hill Road, Loughborough Junction, Pub, The Harriers. Bookmark the permalink.